Newly fitted lead develops a natural patina in the form of lead carbonate when it comes into contact with rain. Future rainfall then washes this soluble substance onto adjacent materials, such as roof tiles or membranes. These materials become discoloured and appear to have an unsightly white staining. To prevent lead carbonate from forming and the discolouration of adjacent materials, we recommend the use of Patination Oil. You simply apply the mixture to newly applied lead, flashings and cladding to prevent white carbonate from developing. With this Patination Oil being formulated by British Lead, the UK’s leading manufacturer of rolled lead sheets, you can be assured of its quality. It is also ideal for all lead flashing and will not have adverse effects on adjacent materials. Although care should be taken when UPVC or bitumen materials are present. This Patination Oil is available in 2.5 litre, 1.0 litre and 0.5 litre varieties. 1 litre protects approximately 60m2of leadwork when applied at a thickness of 75mm on the leading edge and underside of the sheets. Have More Questions About Lead Patination Oil? If you have more questions about this lead treatment, speak to our team online or by telephone. Our Customer Care Team will help you pick the ideal roofing materials for your project, all whilst making mega savings! Q: Why Should I Use Patination Oil? A: When newly laid lead comes into contact with rain, a natural patina begins to form. Whilst this has no impact on the durability of the lead, it can run onto adjacent materials and cause a white stain to appear. You can often see this on old properties that use traditional lead flashing. 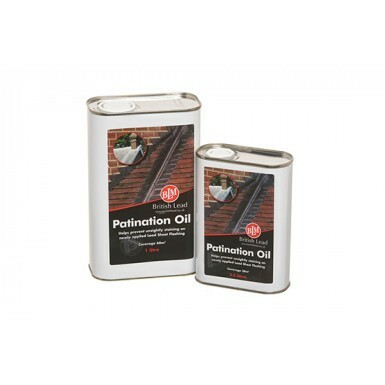 Patination oil prevents this substance from building up and, therefore, stops any staining of adjacent roof tiles or sheets. Q: How Do You Apply Patination Oil? A: Whilst we recommend that all leadwork is undertaken by a qualified tradesman, patination oil is easy to apply. You apply the oil with a clean, soft cloth in straight lines on both the underside and top of your lead rolls. This should be done before the lead gets wet and therefore as soon as it has been fitted. Ensure you are wearing suitable gloves when applying patination oil. Q: Are There Any Circumstances Where You Can't Use Patination Oil? A: Yes. 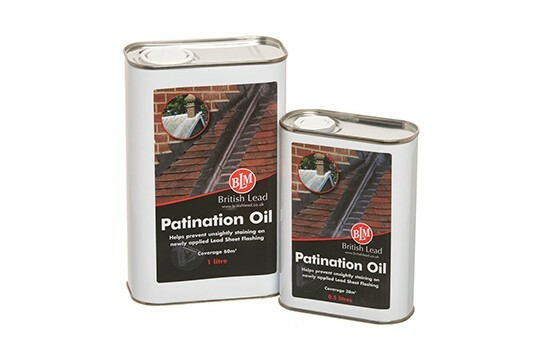 You should NOT use patination oil alongside bitumen or UPVC. Instead you should use Lead-Cote as an alternative lead treatment.